Funny things happen when you start visiting friends in blogland. You meet all kinds of people with all kinds of lifestyles. I love seeing really beautiful homes, and seeing all the fab projects. However, the homes that I visit that make my heart go pitter patter are the rural or farm houses. The ones with SPACE- where there are not size restrictions - or laws - or homeowners associations - or critical neighbors. and as I am prone to do when I visit a new blog, I read a few other posts. That was where I found them. The chickens. Maybe I was a chicken farmer in a past life (the one before I was an African-American country-western singer). I have no idea whether I would actually like having chickens - but my heart LONGS for a few chickens in the yard. I quasi-had a rooster once. In our little urban neighborhood in Kansas City, MO one of my neighbors had a rooster. I never quite figured out which neighbor it was, because the rooster strutted our little corner of the neighborhood like he owned it. His favorite spot to while away the day was under the huge oak tree in our front yard. I guess he liked the shade - or our beautiful grass. Who knows? But he spent enough time in our yard that everyone thought he belonged to us. If he was in the street, cars would stop and knock on our door and tell us that our rooster was in the street. They weren't mad. They just didn't want to kill our rooster. One day the rooster disappeared. Went away. I think he was soup. I was sad. I missed the rooster. Years later we had a yard sale. Countless people came by, not to buy anything, but to ask us whatever happened to our rooster - or chicken - many people called it a chicken. Frankly I only call it a rooster because it crowed and had that red crown thingy on its head. That is how much I know about chickens. Who does this? Who gets chicken envy? Do you long for chickens? Am I weird? Is it because I'm an EMPTY NESTER? Har Har. 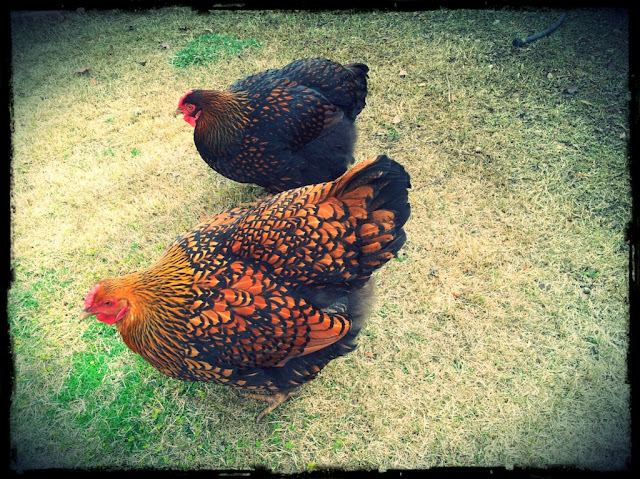 Does chicken poop outweigh the benefits of having fresh eggs and a chicken to love? Am I romanticizing this whole chicken thing? Why? Oh why am I so lonely for chickens???? Is it because I've been COOPED UP for two days trying to clean my house (and reading blogs)? Am I the funniest person EVER? I am filled with questions this morning. *these pics were taken from another blog that did not source any of her pics. Both of these are heavily used on Pinterest and through google images. I have spent enough time trying to source them. Please do not attribute these pictures to me. how funny! i told my husband just the other day, that when my youngest leaves for college in the fall i'd like to get a few chickens. love reading you, keep up the good work! Hi Karen. 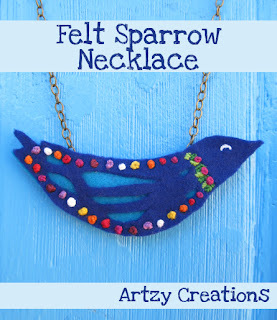 Thanks for the feature of my necklace and my chickens. We love them and they are great. I too wondered about all the chicken poop. It's nothing a garden hose and broom can't fix though. Having fresh eggs from the chickens has been a true benefit for my family and especially my two little girls. So, I say get some chickens. If you have any questions about them, just let me know. Thank you so much for joining in! 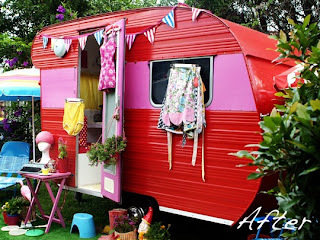 I love that red camper, too cool. Have fun, and keep up the good work! Coming from a farm let me say YES you are romanticising. You can't just go on vacation and leave them with a lot of food. You can't go letting them strut about bothering your neighbors. They stink. They are a bother. My sister's husband romanticises, too. You both have too little experience hauling 5 gallon buckets of water from the house to the barn in 5 degree weather with 20 mile per hour wind at 6:00 in the morning. Every damn morning. Don't even talk to me about the flies and dust. Trailers and chickens. I want both someday! We're moving this summer and hope to get chickens soon after...The tiny trailer will have to wait till all the kids are grown and gone. I agree, those chickens ARE pretty! We have had chickens in the past, someday I think I'd like to have a few close to the garden so they could eat the bugs but I know too they wouldn't stop there, they would also eat things they shouldn't :( good luck with yours in the Fall! It is so good to know it is not just me!! I am an empty nester and have been telling my daughter for the past 6mos that I want chickens. I have even been checking plans to build a coop out of pallets! I have also been making my own laundry soap and household cleaners. I have always been a city girl, but feel like I am turning into a pioneer woman! I love the campers too! So very much want one. Now the chickens...I want them and then I remember what it was like feeding and cleaning up after them as a kid at my Gran's farm. Not so much then. Visiting you from the lovely Debbie's. WHAT I WOULD GIVE for one of those campers!! Those campers are so cute! They would back a great backyard office. I live on 30 acres! But I still have an HOA to deal with and bobcats who think that chickens are fair game for dinner. We used to have chickens when I was growing up, it was fun collecting the eggs. 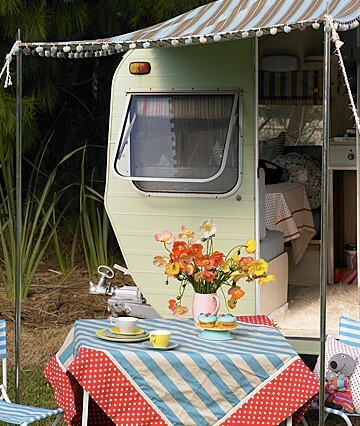 Having a little little vintage caravan is one of my little fantasies, I love them! ps. I hope you get to see some tulips even though the weather isn't playing fair. I've considered getting chickens, but I know it's not possible in the house I live in now because of city ordinances about livestock. But if I lived in the Logan county part of Edmond, I would. I know several people who have chickens in their nice neighborhoods in Logan County. My boyfriend really wants chickens! Especially since we found a new house with a perfect place for a coop! I hope we both get lucky and have chickens someday! I will share a chicken or two with you. Or maybe an egg or two. Sharing chickens sounds like we are eating ours. That's so funny. At least people didn't get mad about "your chicken" being in the road! I hope he just moved to a new home and didn't become dinner. Karen. I am just laughing so hard here at your delightful link for the letter S.
What an absolutely SPLENDID link! I want that little traveler trailer, too. We may have to arm wrestle for it! Thanks for sharing all these lovely pictures. I had to smile over your comment about photo attributes. I need to share a story about a movie producer contacting me re: a photo on my site. Thanks for a nice little getaway today!